Biden has holed himself up in a Delaware hotel to practice, with Maryland Rep. Chris Van Hollen playing the role of Paul Ryan. Van Hollen's Ryan impression: a nice guy launching vicious arguments. Top Obama adviser David Axelrod is in charge of the performance, taking a hands-on role that seeks to learn from Obama's stumbles. Biden's instructions: Be aggressive. 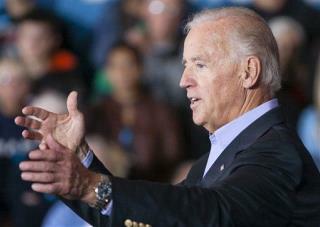 It's very different from Biden's debate with Sarah Palin; this time, says former Michigan Gov. Jennifer Granholm, the VP can "go hard on policy." The veep is reading Paul Ryan's book, Young Guns. Meanwhile, more post-mortem from Obama's own debate: Departing the stage, it seems the president thought things had gone OK. "He knew that Romney had had a decent night as well," says Axelrod. "But it’s very hard when you’re standing there." Later, Obama told his team: "This one's on me." This is going to be a good debate. I still think when it's over Biden will have to do a handstand to go #2. Sam Jack says, "What the f__k" . How will Joe "the blowhard" Biden get his foot out of his mouth, to do any at all debating? ... The "blowhard" blows hard, but in intelligence he is lacking.... The "blowhard will explain what he did, on what he didn't do .. and doesn't know, he didn't do it..... It'll be the same old crap .. "the dumb f__k" Biden .. blaming Bush/Cheney, Halliburton, and the dinosaurs... and Romney and China? Biden will have Pinocchio Ryan, stepping on his nose before the debate is over, with all the lies Pinocchio Ryan will be spewing. He sure can tell big ones, just like his running mate, RMoney.